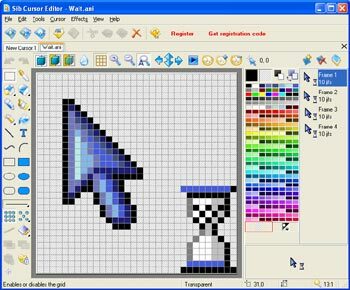 Sib Cursor Editor is your palette, your canvas and your paintbrush for creating cursors of your own. You can become a virtual artist and plunge into the world of art: all you need is to install Sib Cursor Editor. This is a sure way to diversify the look of your desktop and change the monotonous style of your work. With Sib Cursor Editor you'll be able to create and edit static and animated cursors in color depths up to 16 million colors; create and edit cursors for Windows 7 in 32-bit color depth with 8-bit alpha channel. This program will turn work with your mouse into pure pleasure. You can choose any file of the following formats to set as your Windows cursor: CUR, ANI, ICO, ICPR, WMF, EMF, BMP, JPG, GIF, TGA, XBM, XPM and PNG files. Moreover, you can export cursor images to CUR, ICO, BMP, JPG, GIF, PNG, XBM, and XPM files. Working in the program is as easy as this. First you specify the parameters of a cursor you're going to paint (its size, color and conversion modes) and then you start the process of creation itself. Once you've started working, the whole variety of painting tools will be at your service, including modification of images with drop shadow, opacity, smooth, negative, grayscale, colorize, rotate, roll and mirror effects. What's more, you'll be able to export animated cursors to animated GIF images and image list bitmaps and extract cursors from Windows executables, libraries and animated cursor files. This Cursor Editor is all you need to turn your mouse arrow into a piece of art! Recent Changes: Improved compatibility with 64-bit Windows OS.